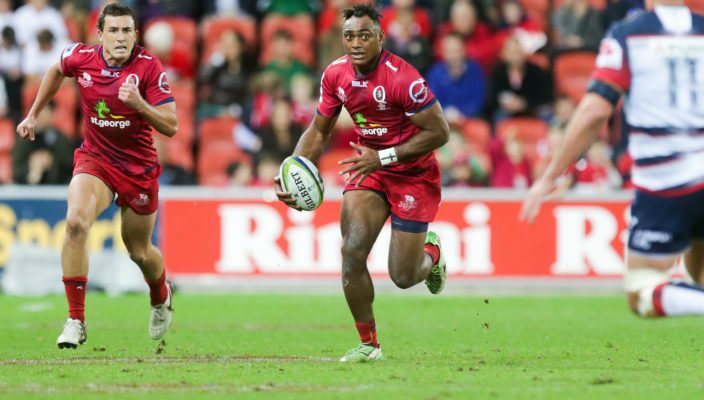 The St.George Queensland Reds have been denied a fairytale send-off for departing veteran Greg Holmes, with a 31-28 loss to the Melbourne Rebels at Suncorp Stadium on Friday night. The Reds had their work cut out for them, after trailing 24-7 at half time. Queensland staged a spirited comeback in the second half, but were unable to clinch a win in what was also the final for loyal servants Ben Daley, Saia and Anthony Fainga’a, Liam Gill and Curtis Browning. Reds co-interim head coach Nick Stiles said: “We know we weren’t good enough tonight and that’s disappointing because there was a lot to play for. We wanted to finish the season with something we could all be proud of, but our execution let us down too many times in the first half. They trailed by three points with five minutes to go but were unable to land a knockout punch despite controlling possession. Scrumhalf Nick Frisby and stand-in captain Liam Gill led the charge, with the latter scoring his first double in Reds colours. Lock Kane Douglas, who only recently returned from injury, showed the menacing tight-five presence the Reds had recruited him to be. And debutant fullback Tom Banks showed enough promise with and without the ball to suggest it was not his last sighting in a Reds jersey. The Reds were their own worst enemies in a first half dominated by the Rebels. A rampant two-try contribution from Sean McMahon and a series of defensive lapses cost the home side dearly as it headed to the sheds down 24-7 at the break. The Rebels’ fast moving defence and mobile back row also made it difficult for the Reds to build any pressure of their own. Perhaps the only highlight of the half was Queensland’s try which was started and finished by Frisby. The scrumhalf had already kicked deep into Melbourne territory and generated momentum with a quick tap. He handled twice more in the movement before diving over next to the posts. To be any chance the Reds had to land some blows early in the second half and they did so on the back of 15 minutes of sustained territorial dominance. Gill’s first try sparked the comeback, and the contest was again up for grabs after Samu Kerevi danced his way over using a combination of an angled run and fast feet. The fightback lost some of its momentum, however, when Nic Stirzaker scored a try from a charged down kick. MELBOURNE REBELS 31 (Sean McMahon 2, Tom English, Nic Stirzaker tries; Jack Debreczeni 4 conversions, penalty) d St.GEORGE QUEENSLAND REDS 28 (Liam Gill 2, Nick Frisby, Samu Kerevi tries; Frisby 3, Henry Taefu conversions).